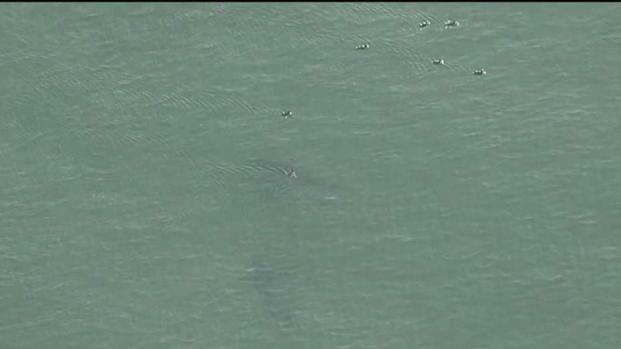 NBC10 Boston's Sky Ranger was over a great white shark off Long Nook Beach in Cape Cod on Wednesday, showing how close the shark was to the beach. The footage was recorded less than two hours after a man was bitten by a shark in the same area. It has not been determined if this is the same shark that attacked the man. Hospital officials say a man bitten by a shark on Cape Cod last week is recovering, upgrading his condition from fair to good Wednesday. Long Nook Beach, where 61-year-old William Lytton of Scarsdale, New York, was bitten by a Great White shark, remains closed indefintely. Lytton's condition was upgraded Sunday from serious to fair, but hospital officials said Wednesday he is now in good condition. Swimming has been prohibited at the Truro, Massachusetts, beach since the attack. Lytton suffered deep puncture wounds. He was taken by medical helicopter to Tufts Medical Center. Hospital officials say a man bitten by a shark on Cape Cod earlier this week is recovering, upgrading his condition from serious to fair. Meanwhile, officials are considering closing Long Nook Beach in Truro, Massachusetts, indefinitely following the attack and other reported shark sightings. It's unclear when the beach will reopen. Officials closed the beach due to the attack and a number of shark sightings there.